OUR OTHER CURRENTLY FEATURED BOOKS, “GETTING RIGHT,” BY GARY D. WILSON AND “WATCHFUL REALM,” BY LYN SPITERI, CAN BE FOUND BY SCROLLING DOWN BELOW THIS POST, OR BY CLICKING THE AUTHOR’S NAME ON OUR AUTHOR PAGE. 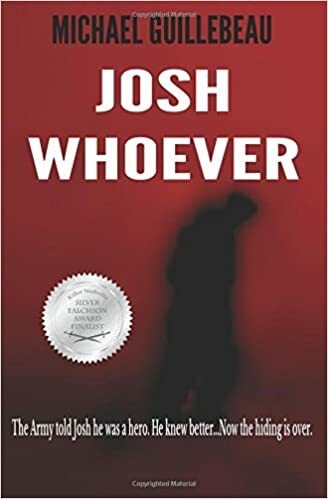 SUMMARY: Josh was an army veteran, but a maneuver-turned-massacre cover-up threw him into a hero’s harsh spotlight. After walking away from it all, Josh, who’s been pulling scams for a living, takes refuge in the bottle and tries to stay invisible. But his latest con puts him in the sights of a Russian mob family convinced that he is a private detective—and the only one who can find missing reality star Kiev Romanov. As Josh digs at this mystery, he is joined by unemployed newspaper editor Marci, who’s hoping to use this scoop to relaunch her writing career, and Kiev’s killer brother, Yuri, who believes he is Batman. In pursuit of the heiress, Josh uses his con man skills and tangles with Confederate zealots and a paramilitary group. He knows if he does not save the girl, he can kiss his last drink goodbye—along with his life. THE BACK STORY: JOSH came out of a single image: an ordinary guy trying to get along in a world that wants to cast everyone as a hero or a bum. Knowing he’s not the hero the world thinks he is, Josh drops out and tries to be a bum. But then the world needs a real hero. WHY THIS TITLE? : The title, JOSH WHOEVER, started out as a place-holder, but hung around because it resonated in two ways. First, Josh is hiding, and gives no one his real last name. Second, he really represents all of us doing our best in an overwhelming world that often demands the best of us, without really understanding what that best is. WHY WOULD SOMEONE WANT TO READ IT? There’s a great poem about the beautiful, rowdy prisoners of life. If that concept resonates with you, and if you like to laugh, JOSH might be for you. AUTHOR PROFILE: I’m one of those guys who wanted to be a writer when he was young, but spent his life making house payments (in my case, writing software for the International Space Station). At the age of 58, I started writing again. I’ve published three books and dozens of story since then. Quit my day job when JOSH was published, and haven’t looked back. I only took this job to get fired, but now I stood here raising my hands in the air like any good citizen being robbed. Two robbers had popped into the bank from nowhere. From inside my little bank teller window, I had no real view of them walking in the door but now they strutted around in white paper lab suits, looking like big bunny rabbits waving guns at random around the bank lobby. His eyes darted from teller to teller looking for a challenge. The young girl in front of him just stood there frozen. He waved his gun at the ceiling and let off a burst and the girl screamed and opened her drawer. “This. Is. A. Robbery.” He shouted each word loud and important, like he was hyping a band at a rock concert. Like we needed a program to tell us what’s going on here. Like I needed a program to tell me that my own future was over if they got away with this robbery. The short one reached up with the barrel of his AK-47 and pushed away the video camera over the door so that it saw only the ceiling. They started at the far end and worked their way down the long row of tellers toward me. I stood motionless and watched, curious about how they did this. I knew plenty about small-time scams, but I’d never seen a big-time bank robbery like this before. The tall guy did all the talking but looked at the silent one for something. There: that was it. Silent shook his head, and Tall skipped a teller. Silent knew something; he skipped the tellers with dye packs. I admired them for pulling this off, admired the details: the paper lab suits were a good touch. No one would remember anything about the robbers except the white suits with hoods. Probably buy them cheap at some med supply place; add a white ski mask, and you can wear anything you like underneath. Except for the shoes. Tall had flashy basketball kicks that demanded respect on the street, what you’d expect from a robber. But Silent had a pair of black Ferragamos, rich businessman shoes that cost three hundred dollars new, except his weren’t new. The kind of guy who would buy these shoes wouldn’t keep his shoes this long; he either had money or worked for guys with money and had to keep up. Either way, it stood out and it offended me. I was a pro in my own way. I respected pros. You’ve got to get the details right. The two guys moved the same way: pro, but with a flaw. They looked casual, even random, but I could tell it was rehearsed. No one but me would remember that later, and that was good. But the body language had a flaw. Tall moved like a bank robber in a movie, all swagger and attitude, waving the gun around and yelling at anything. Silent faded into the background and that was good, too, but the pose was wrong. He hunched over and shuffled like a kicked dog. This wasn’t a man used to demanding other people’s money. Silent begged people for money every day and hated doing it but had to pay the rent. There, in a flash I had it. Silent’s walk and Silent’s shoes belonged to Robert, the assistant manager of the bank. I watched him get pushed around every day by the manager. Now Robert was getting his payback. See, that was the tell, the one detail that betrayed all your hard work because it was too much a part of who you were for you to even know it was there. I knew how to stay in character and keep the game going until I got to the payoff. Even now, when I wanted to grab the guys and tell them to start over, to come through the doors this way or that, even now I just stood there impassively with my hands in the air. I wanted to tell them: be a pro. Be a pro, or be burned. I reached over quick and took the dye pack from Kelly’s open drawer, one of the old-style packs with a timer. Kelly smiled weakly back at me, chewed her gum faster and looked away. I pressed the timer button and put it in my own drawer. Tall came to me and waved his gun. I smiled and scooped up the cash and dye pack and shoveled them on top of the money in the bag. I felt like saying “sorry” to the big bunny rabbit, but the best I could do was apologize in my head. Sorry, I thought, but I can’t let San Francisco’s finest look at the personnel records and ask me questions, the kind of questions these giant companies should ask before they hire someone but never do. Big dogs can’t be bothered checking on the little guys who really make up their companies. And that’s why I hated these companies, hated so much of the world: be a pro, treat people and your job with respect, or get out. WHERE TO BUY IT: Amazon, Barnes & Noble. PRICE: $25 for the hardback, but I’d recommend the paperback at $12.99 or the Kindle version for $3.99. CONTACT THE AUTHOR: Email me at michaelguillebeau@gmail.com, or on Facebook at Michael Guillebeau. I’d love to hear from you.